The book says the pattern is from 1847, and was designed by a lady named Jane Gaugain. 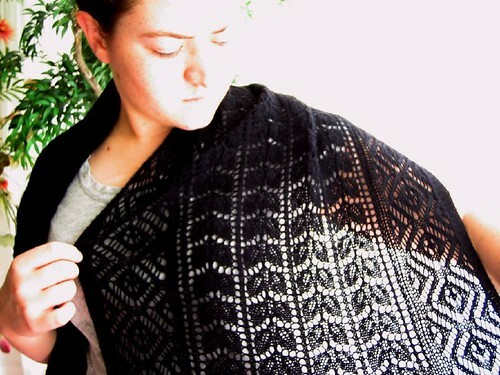 It is knitted as one piece, and the points on the edges are made during blocking. I made no modifications, but there is a tiny error on one of the charts. There is a knit square where there should be a purl square on the chart for the center, but it is very obvious. They call it a scarf, but I think it's really more like a stole. It's wide enough to wrap yourself in and keep your arms warm. I used some leftover Koigu to help with the blocking. The pins weren't working on their own, so I tried the Yarn Harlot's method for the second time. It didn't work very well the first time I tried it, but this time it helped a bit. 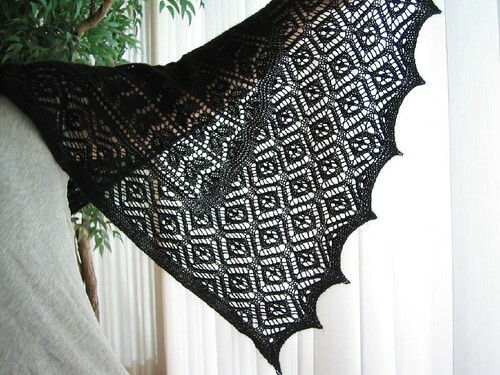 It makes me want some blocking wires for Christmas, or just to only make lace with all scalloped edges. I can't believe I have to give this away -it is one of my favorite things I've ever made. The pattern is so pretty and the fabric drapes perfectly. I will have to make another and keep it for myself. This is a Christmas present for my boss' wife, who is one of my favorite people in the world. Whenever I wear my Print o' the Wave, she always asks me to make her one. She has a very classic style, her clothes are all very simple, but when she decorates her house it is very opulent and rich, and she always likes things that look like they were from Victorian times. 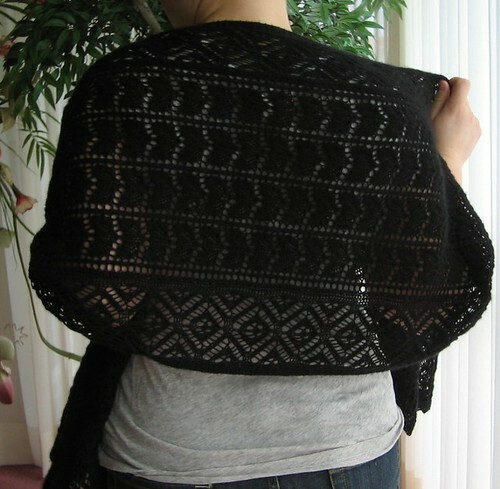 I think she'll like this piece, and it's black so she can wear it with nearly anything. We have a fancy dinner to go to next Saturday, so I'm going to give it to her early in case she wants to wear it to the dinner. They are going to London for Christmas, so hopefully she'll be able to use it there, too. She certainly won't get many opportunities to wear it here in Florida. People (non-knitters) sometimes ask me how long it takes me to make things. I always sort of try to figure it out and say a few weeks, or a few months. One of my friends asked how many hours it took to make a pair of socks. I had no idea, because it takes me more than hours to do it, so I told him maybe ten or twelve hours, but I still have no idea. Because of this I tried to keep track of how many hours it took to make the scarf. I got to about 17 hours and then lost track, but I think I worked out it would take about 22 hours with the average time per repeat. So whenever people tell me I should sell my knitting, I just tell them it would be too expensive. I'm sure a lot of knitters have that conversation with people. There are more on flickr, if you click on one of the pictures it will take you there. 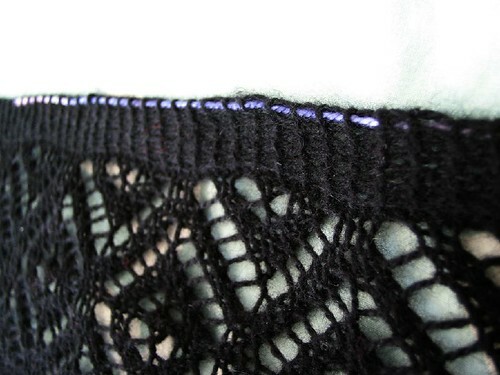 I don't think it's harder to knit black lace, but I think it's harder to photograph it. I'm curious, as I have two skeins of the 2-ply cashmere/silk if you finished this with two skeins, or if you needed a bit of a third?